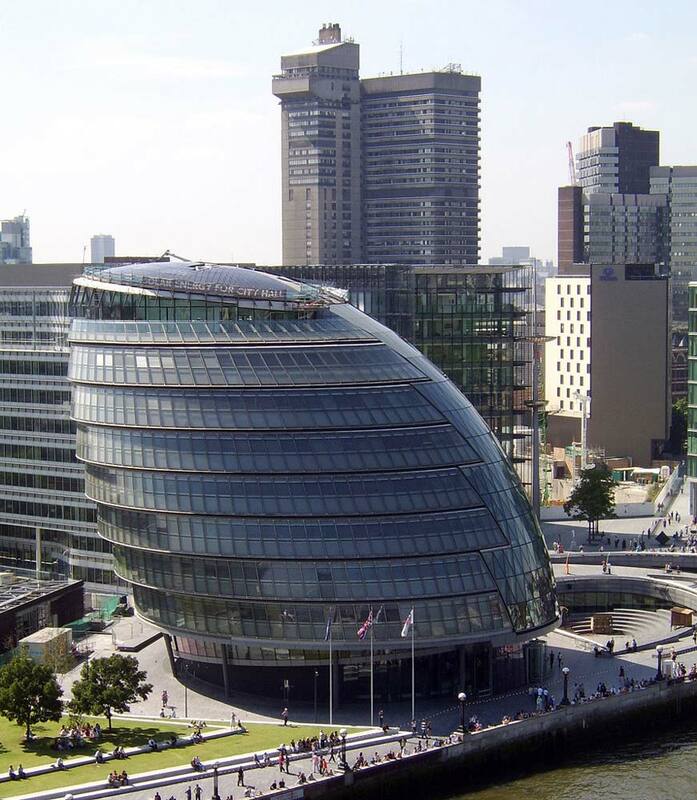 The City Hall in London is the headquarters of the Greater London Authority (GLA) and the Mayor of London. City Hall is located quite close to the city center, and parts of it are open to visitors on weekdays. The structure, which cost around $70,000,000 to build, is not owned, but leased, by the GLA. Visitors can see the Mayor’s strategic plans for the city at City Hall, and tours of the building are also available. City Hall also hosts exhibitions and public meetings on a regular basis. The building is an eye-catching, iconic, modern structure that opened in 2002, and fronts on to the river Thames. Sir Norman Foster, who was given a specific brief to come up with a structure that would become a new landmark in London, designed it. Unlike many new London buildings, the City Hall is not very high, being just 45 meters tall with 10 floors. The facade is made primarily of triple glazed glass, and the front of the building slopes backwards at an angle of 31 degrees. It was designed to be environmentally friendly. The building’s shape reduces surface area by 25% compared to a standard rectangular building, with a consequent reduction in heat loss. The building reduces electrical consumption by using solar panels on the roof, and an innovative cooling system that does not require air conditioning. Instead, cold water extracted from bore holes beneath the building is pumped around to act as a coolant, and that water is then used to flush the toilets.